Stocks rallied on Friday because of good news. Imagine that. The November jobs report was solid in just about every way, and until recently, that would have been bad news for stocks because of the risk that the Fed would raise rates. This time, stocks surged: The Dow finished the day up 370 points -- a gain of 2%. That more than wiped out the 252 point loss from Thursday when the European Central Bank didn't announce a bigger economic stimulus plan. So why is Wall Street embracing a likely rate hike in two weeks? For starters, Friday's jobs report should end any lingering concerns of a serious slowdown in the United States. This summer, the market and economic turmoil in China had many worried that the U.S. stock market was set to plunge too. U.S. stocks did fall 10% from their peaks -- a so-called correction. 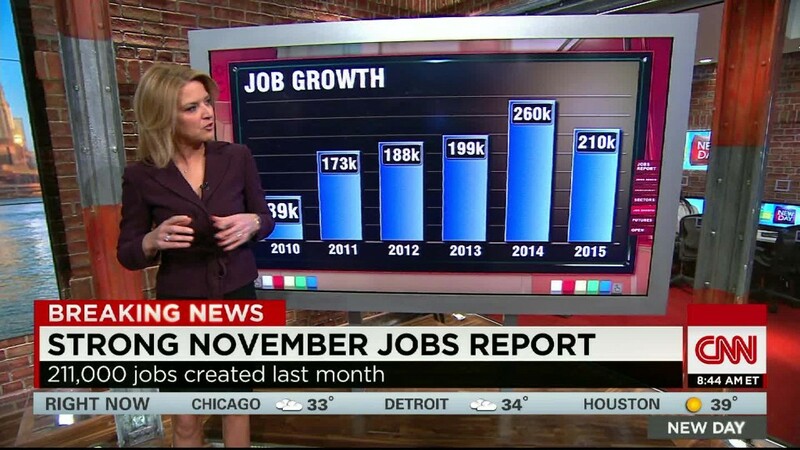 And job growth did cool off a bit. But today's news was that fewer people are out of work and wages are rising. "It's nice to see good news is good news," said Dan Farley, regional investment director at the Private Client Reserve at U.S. Bank Wealth Management. Another reason for the rally? Investors are happy that there may FINALLY be some clarity about the Fed's next move. Wall Street has been speculating about it since the start of the year. Now, a rate hike is all but certain. "Pretty soon people are going to have to start asking, 'Where were you on June 29, 2006?'" joked Jeffrey Cleveland, chief economist with Payden & Rygel. He's referring to the last time the Fed raised rates. Higher interest rates will also help many banks, because they are able to charge more for loans when rates go up. With that in mind, bank stocks led the market rally Friday. Shares of megabanks JPMorgan Chase (JPM), Citigroup (C), Bank of America (BAC) and Wells Fargo (WFC) were all up more than 2%. So were shares of big regional banks SunTrust (STI), PNC (PNC), BB&T (BBT) and U.S. Bancorp (USB). Comments from ECB chief Mario Draghi helped lift the market too. Speaking in New York Friday afternoon, Draghi stressed that the ECB could still boost the size of its bond purchases if needed. That reassured investors who were not happy with the scale of stimulus the ECB announced Thursday. So what's next for stocks? December is often a great one for stocks. Traders often refer to the typical market surge in the last few weeks of the year as a Santa Claus rally. If that happens again this year though, Santa may need some motion sickness pills for him and his reindeer. The first four days of December have been incredibly choppy. The Dow has had a triple-digit point move every day while the S&P 500 has gone up or down at least 1% each day. Up. Down. DOWN! UP!!! And the volatility may not be over. Once the Fed gets the first rate hike out of the way, the market is likely to start obsessing about how high rates will go. There is no clear consensus on that yet. Cleveland said at least three or four rate hikes are likely in 2016. But Farley thinks the Fed is going to be more cautious since rate hikes would strengthen the dollar further ... something that could hurt corporate profits even more than they already have been.